We believe that collaboration plays a key role in our approach to scientific discovery and progressing knowledge about NGLY1. Our scientists collaborate on a daily basis all over the world, but so do our NGLY1 families. A very helpful aspect of our conference was that it gave parents opportunities to share experiences with each other about their child’s NGLY1 Deficiency and their approaches to mitigating certain symptoms. We hope that the established connections can continue to foster these collaborations between families in the future and allow for the exchange of knowledge and tips on useful treatment. The Jennison and Vincent family, both who attended the conference, were willing to share their experiences with a variety of therapies that their children received. Both families have two NGLY1 affected children: Charlie and Jane Jennison and Thomas and Quentin Vincent. Ann Marie Jennison, mother of Jane and Charlie, described a variety of therapies her children underwent including speech therapy, occupational and physical therapy, hypobaric oxygen treatment, acupuncture, equine therapy, as well as music and vision therapy. When asked to rate which treatments she thought were the most useful to her children, she ranked the physical and occupational therapy amongst the most helpful, but nothing really topped the equine therapy. Living 15 minutes away from one of the best equine therapy centers in the country, The Shea Center in San Juan Capistrano, Ann Marie suddenly had an epiphany. She had volunteered at this center every summer when she was younger and now years later realized that this therapy could be beneficial to her children as well. And so both Charlie and Jane consistently participated in equine therapy once or twice a week: Charlie for 5-6 years and Jane for 2-4 years. The physical rehabilitation horse therapies were specifically constructed for riders with muscle, bone and nerve impairments and allowed for the development of better strength, balance and coordination. Cognitive equine classes are also offered, to address processes of the mind such as planning, judgment, memory, orientation, concepts, attention and language. 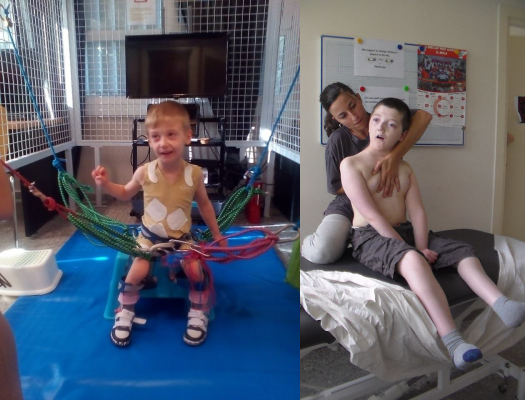 The Vincent family travelled throughout Europe to try out different therapies. They took a trip to Spain right after our conference in July for a two-week intensive neuro-rehabilitation program (4 hours of therapy per day) called the “Essentis Method”. This was also where Quentin and Thomas Vincent underwent their first therapy in 2015 and where they received their NGLY1 diagnosis through exome sequencing. At the end of the Essentis Therapy in 2015, real progress was seen for Quentin who started crawling for the first time. The family also travelled to the Children’s Residential Therapy Centre Zabajka 2 in Poland. Both the therapies in Spain and Poland turned out to be quite useful for Thomas and Quentin as they were able to relieve a lot of Thomas’s back and neck tensions and correct Quentin’s minor scoliosis with help of a chiropractic. 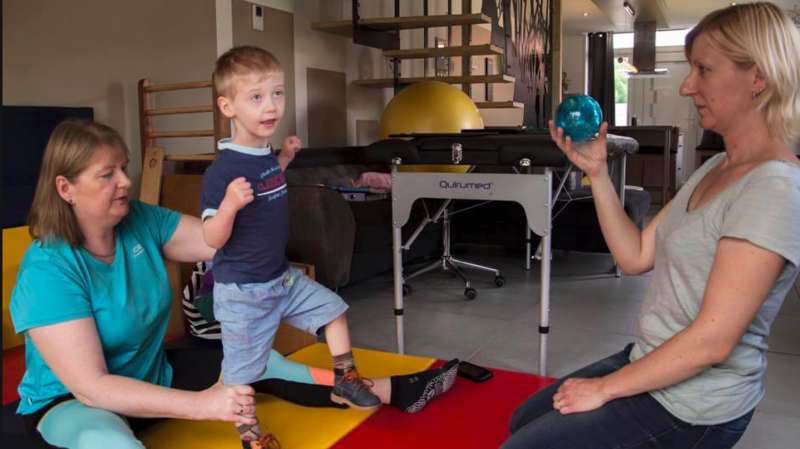 An unforgettable moment for the Vincent parents was when Quentin started standing up in bed, after completing some regular CME MEDEK psychomotor therapy. CME therapy is specifically developed for infants with delayed motor development and focuses on the brain and its natural recovery potential. The therapy concentrates on neuromuscular stimulation and exposure to the influences of gravity, with the main goal of achieving complete motor independence (independent sitting, standing or walking). The Vincents also tried the “Padovan method” (neuro-functional reorganization) that emphasizes the interdependence of walking, talking and thinking and reiterates the development of each these steps to ensure a desired harmony. The parents concluded that it seemed to be less appropriate for Vincent and Thomas, but suggested that this type of therapy should not be put aside, as each child is different and has different needs. A big thank you to the Jennison and Vincent families for sharing their experiences with us: occupational and physical therapies, neuro-rehabilitation, and other therapies all play important roles in the improvement of NGLY1 symptoms and progression of motor and cognitive skills for the patients.